Where is it that brings you to a state of pure joy and bliss? To that state of mind we call a “happy place”? While you’re thinking, we’ll share a few happy places of ours with you: first, the one that’s in the picture above, the hammock under the palm trees on the lava rock coast of Hawaii. We’ll always remember that feeling of being suspended between two palm trees with the love of our life, looking up at the fronds, and hearing the salty waves. But our other happy places are a bit more local: playing Frisbee at the park with our pup, and at a table in the sun at our favorite lunch place. We also have a special place in our heart for the spot right on the water’s edge at the beach so that the water can lap at our toes. Happy, happy, happy!!! 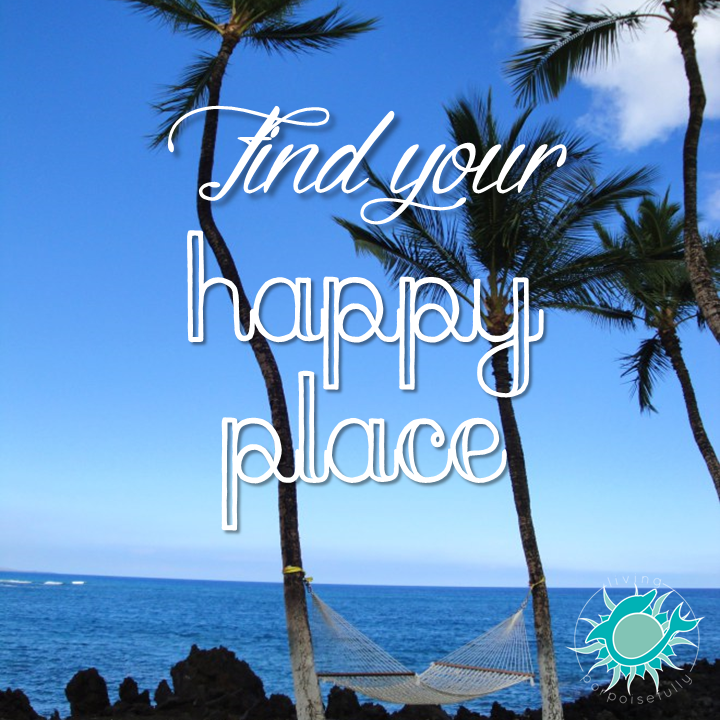 Got your happy place in mind? Just the thoughts will bring you joy, so take a few moments to visualize it in all sorts of detail and with all of your senses. Let it take you to that blissful, joyful state of mind that only a happy place can. Love this idea! Thought about the places that make me the happiest and it was a tie breaker. Sitting under a shady tree and reading or watching my bees has always been very relaxing. I think broadly it can also relate to an action, like backpacking in a quiet area. Some of my favorite memories involve hiking in the wilderness. Thanks for the post! Oh this makes me happy hearing about your happy places! I agree, happy places can be in doing an activity too. Backpacking, crafting, snorkeling, you name it. Thanks for spreading the happy!